Taking its inspiration from critical studies in the history, culture and politics of technology, this blog will follow developments at the interface of humans and computationally-based machines. My main focus is on remotely-controlled weapon systems, with forays as well into other domains in which robots are imagined as central to the lives (and deaths) of humans (most prominently, in elder care). For the most part I’ll be responding to media reports of these developments, but I’ll point along the way to sources that can help us to think critically about the unquestionned assumptions that these stories repeat, at the same time that they purport to be telling us about things that are unprecedented and, most disturbingly, inevitable. A central goal of the writing that follows is to identify the contingencies that make the futures reported highly uncertain ones, and to contribute to ways of imagining and making our futures differently. 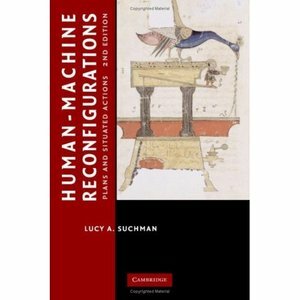 For readers with a more academic bent, related publications are Lucy Suchman Human-Machine Reconfigurations (2007) Cambridge University Press; Subject Objects (2011) Feminist Theory 12: 119-145; Animation and Automation: The liveliness and labours of bodies and machines (with Jackie Stacey, in press) Body & Society; and (with Claudia Castañeda) Robot Visions (in progress). There was a recent article in The Nation about drones and their ethical and other implications….